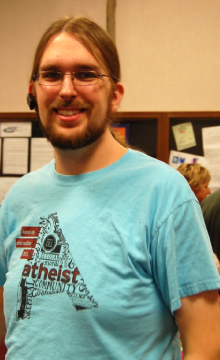 I have happily served the Kansas City Atheist Coalition as a founding board member and president for two years. KCAC has added a huge amount of personal enrichment and joy to my life. It has been enormously gratifying to watch KCAC grow into the exceptional organization it is. While I am proud to say I have helped KCAC’s development, I also understand that organizations need to adopt new leadership to allow for fresh ideas and to progress. As I step down from my board position and the KCAC presidency, I am as happy and proud today as I was when I helped found the organization two years ago. As vice president, Josh Hyde will assume the role of acting president until KCAC’s officer elections in October. I am confident that Josh will continue to serve KCAC as an outstanding leader, and I look forward to seeing KCAC prosper and grow under his and the entire board of directors’ guidance. I will remain in service to the Kansas City freethought community as a board member of Camp Quest KC and organizer of the KC Skeptical Women Meetup group. Looking back on the past two years with KCAC, I hope I have benefited the Kansas City Atheist Coalition half as much as it has benefited me. We are pleased to announce that our vice president, Joshua Hyde, will be acting president until the officer elections, currently scheduled for this coming October.In addition, KCAC’s treasurer and member of the board of directors, Kimberly Dobbs, has stepped down for personal reasons. Although KCAC is saddened by the loss of Ms. Dobbs, we are excited to announce that Daniel Boyd, with a treasurer background and strong background in financial institutions, will be assuming her duties as KCAC’s official treasurer.We look forward to continue serving our community in ever-increasingly new and innovative ways as we progress forward under this new leadership and assembly of officers and directors. To learn more about our directors and officers, visit their profiles in the Volunteer section of the website. 2 Comments to "Josh Hyde Acting President; Sarah Hargreaves Steps Down"
Good luck Josh and Daniel! I think you guys will do an awesome job. As a Christian, I apologize. I wish you every success on your alternate plan of adopting a family for Thanksgiving. I very much respect your efforts.